Leaks and moisture buildup can do serious damage to your home before you even realize there’s a problem. The damage doesn’t happen without some warning signs, though. Staying alert for the signs of home water damage helps you catch problems early so you can prevent further damage and protect your family from harmful mold and bacteria. The evidence water damage leaves behind isn’t always obvious. It can range from a puddle on the floor to a mysterious musty odor caused by mold growing somewhere you can’t see. The most obvious sign of a problem is a puddle of water anywhere it shouldn’t be. If it’s near an appliance, fixture or pipe, check there for damage first. That includes appliances and fixtures on the upper floor that could be causing water to leak through the ceiling and onto the floor below. Remember, though, if the floor is uneven, water can flow and pool somewhere that isn’t immediately near the source. If the water is coming from a leak in the roof, you can try to pinpoint the damage by inspecting the roof from the attic, but this isn’t always possible. Water can enter one part of the roof, then travel until it finds a weak spot to infiltrate. Having a professional inspect your roof is the most reliable way to start addressing the damage. Mold thrives in damp conditions, so any time you find it growing, it means there’s excess moisture coming from somewhere. Household mold usually takes the form of flat blotches of black, grey, brown, orange or green, but a variety of textures and colors are possible. If you find mold inside a cabinet, on the floor around the sink or toilet or growing in a line on a wall containing a pipe, chances are that fixture or pipe is either leaking or sweating excessively. Mold around the windows suggests a condensation problem, but it’s still worth checking for leaks. On the other hand, mold growing in the cool, dark corners throughout your home, such as behind furniture, under rugs, and on the undersides of shelves, most likely means your indoor humidity is too high. 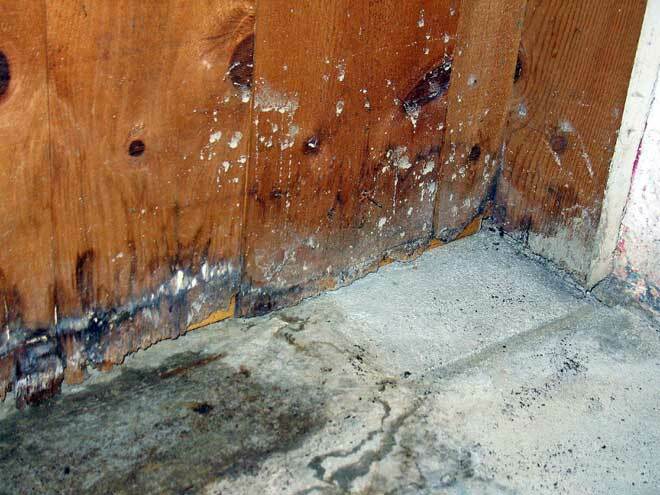 Standing water and damp building material are rich breeding grounds for mold, bacteria, and rot. These issues typically happen with porous material, such as wood, drywall, and carpet. Often, the damage is hidden from view inside a wall or under the flooring. You might not see any problems, but you’ll notice a musty, earthy smell similar to damp leaves in the fall or less commonly, a dirty sock smell. If a sewage line is leaking, you’ll smell sewage. Cleaning the room, opening the windows, and using air fresheners won’t get rid of these smells permanently because you’re not eliminating the source. To clear the air, you’ll need to stop the leak or condensation issue, then remove or thoroughly clean the damaged material. Not all mold gives off an odor, though, so a lack of bad smells doesn’t always mean your home is free from water damage. If a pipe in the wall is leaking or sweating, or condensation is forming due to poor insulation, moisture can build up inside the wall. When that moisture seeps through, it can cause paint and wallpaper to bubble and peel, and leave brownish or yellowish water stains behind. Wall damage and stains that show up in a straight line, following the line of the pipe behind the wall, are clear signs something is wrong with the pipe. Dampness, staining, and deterioration on the lower parts of your walls suggest condensation problems caused by poor sub-floor ventilation or leaks due to poor foundation drainage. More rarely, in older brick houses, it happens because the house’s damp-proof course (dampness barrier) has failed. This kind of home water damage is tricky to diagnose, so contact a certified, experienced water damage specialist if you find signs of it. Bubbling and peeling wallpaper on walls throughout your home is more likely to come from high indoor humidity. A severe leak can soak part of a ceiling or wall with so much water that the extra weight causes the surface to sag or bulge. This is especially common in ceilings of rooms under chronically overflowing tubs and toilets. It usually affects a small area limited to the size of the leak source, but the damage will grow if neglected. Water damage like this is a safety hazard because the ceiling or wall is a risk for sudden collapse. Wherever water in your home comes from, gravity will eventually bring it to your floor. Once there, it can seep into the carpeting, wood flooring or even tile, then move on to the subflooring and joists. 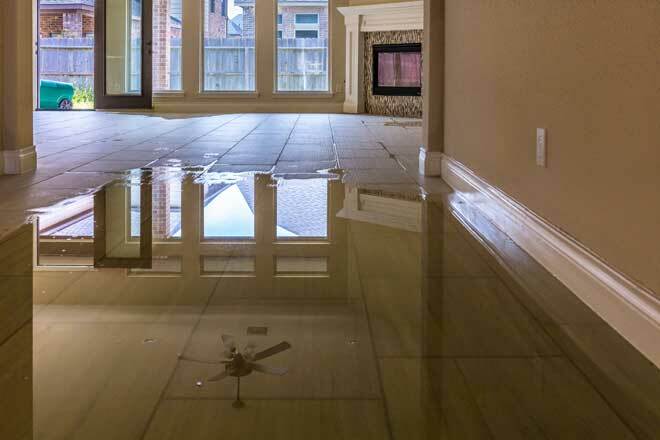 Because water damage to flooring is so common, it’s a good idea to inspect your floor if you think your home has moisture problems now or has had them in the past. Stains – Lingering water can leave blotchy dark grey or brown stains on wood floors. Warping and expansion – Dramatic changes in moisture levels can cause wood floorboards to warp, so they look misshapen, and gaps appear between them. If they absorb enough water, both wood and laminate floorboards can expand and turn up at the edges, leaving a raised seam between each board. Buckling – Severely waterlogged wood flooring can completely detach from the subflooring and buckle into sharp peaks. Bubbling – The top protective layer and photographic layers of laminate flooring are vulnerable to water damage. If the flooring gets too wet, these layers can bubble like damp wallpaper. Sagging – Wood flooring that’s suffered repeated or long-term water damage can start to rot. It will feel soft and spongy when you step on it, and eventually sag. With any type of flooring material, water can seep into the subflooring and cause sagging. Cracking – Floor tiles can crack and sink if the subflooring beneath them becomes too badly water damaged to provide support. Home water damage is more than just unsightly. Ignore it, and it can spread, eventually rotting the wood structure of your home. The mold and bacteria buildup isn’t great for your health, either. If you spot signs of water damage in your home, contact a certified water damage specialist. They can diagnose the problem, then offer guidance on how to solve it and repair the damage to prevent any further harm to your home or your health.